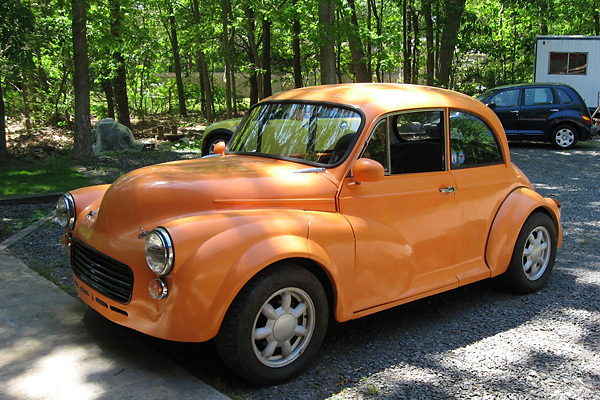 She's not a V8, but a Morris Minor with a 1600 twin cam, 5-speed, four wheel discs, independent suspension, etc. I got the urge to do something different due to the fact that I got laid off of my job of fifteen years and had lots of time on my hands. I'm not one of those people that can sit around and watch TV, and I already had the Minor in my yard. 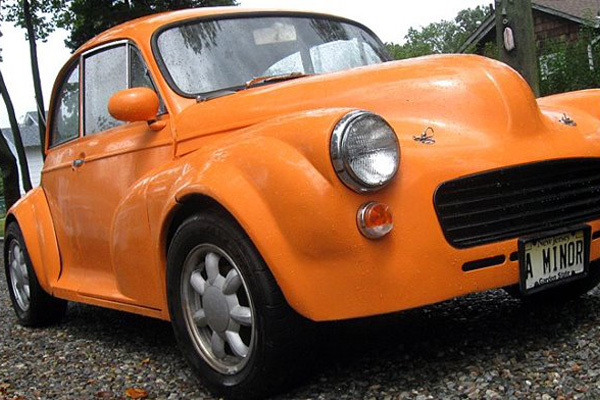 We had originally built this Minor up from a bare shell for my son to use as his first car. That time, we used a donor 1973 MG Midget for the engine, transmission, rear end, disc brakes, and anything else we could. 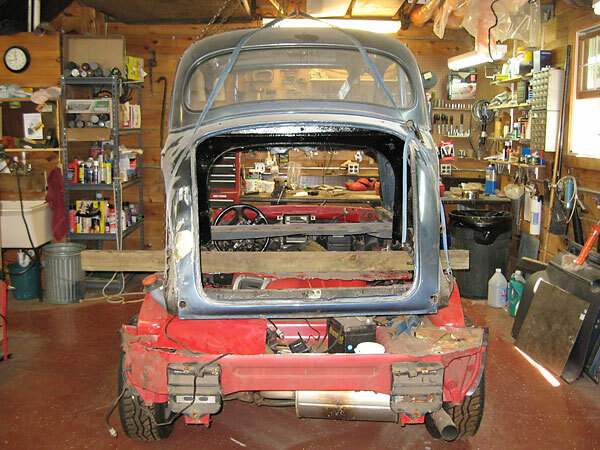 All those parts eventually transferred into a 1960 Minor tourer. Then this 1992 Mazda Miata came along. It was a gift from a friend who had used it for autocross racing. She was in decent mechanical shape, but body-wise she was quite rough with dents, rust, etc. I kept the Miata drivable through this project because I didn't want to get involved in all the electrical problems that might arise. 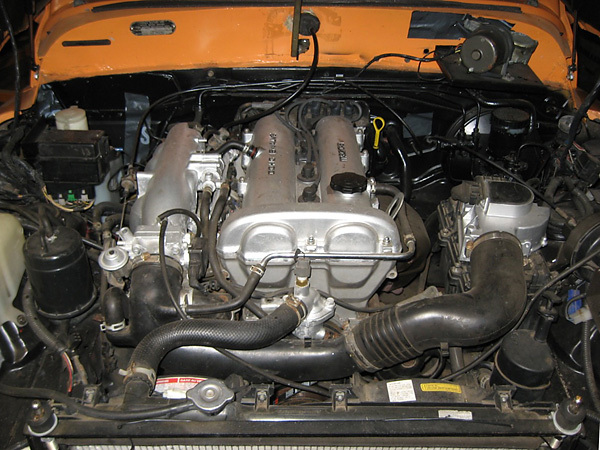 Engine: stock Mazda Miata 1.6L DOHC fuel-injected four cylinder (~186,000 miles). Exhaust: stock Mazda Miata, modified from rear axle out to fit shortened rear end. Transmission: stock Mazda Miata 5-speed. Dodge PT Cruiser shift ball, modified. Rear End: stock Mazda Miata. Front Suspension: stock Mazda Miata. Rear Suspension: stock Mazda Miata. 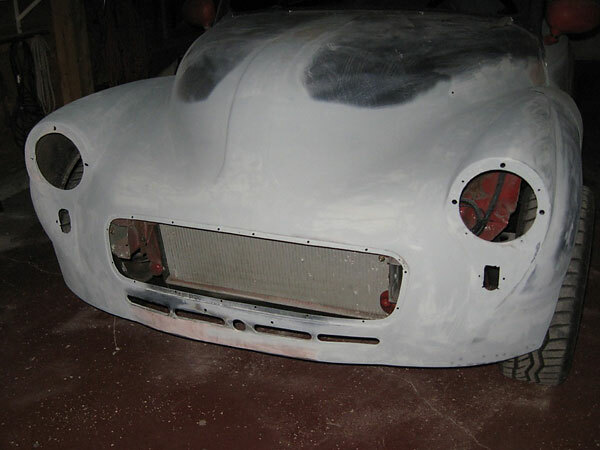 Body: Bumpers removed. Front end welded into one piece unit. Mazda Miata side view mirrors. All original glass. Miata fuel filler lid. 1974 Volkswagen Beetle taillights. Rayflex "Omaha Orange" with a little white added. 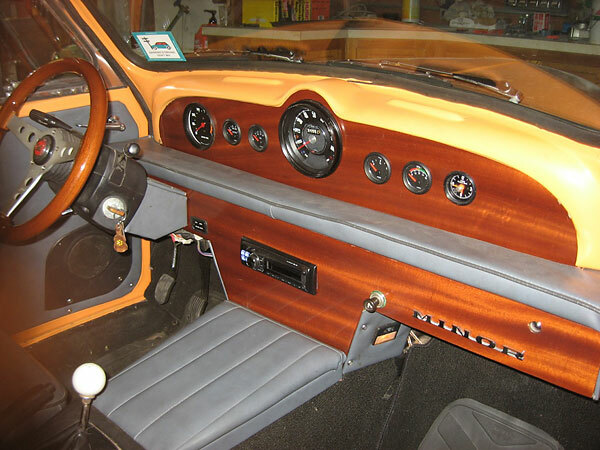 Interior: custom mahogany dashboard. Morris Minor speedometer. MGB tachometer. VDO small gauges. Grant GT steering wheel (with Morris horn button). MGB pedal pads. MGB windshield wipers. Modified Mazda Miata center console. 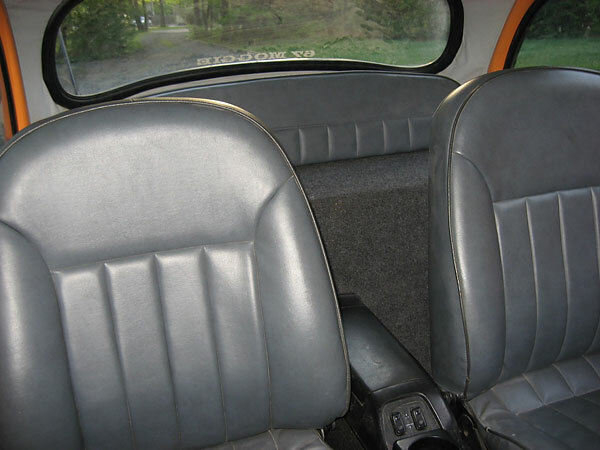 Junkyard seats reuphostered and fitted to Miata rails. Comments: Being on a fixed budget, I decided to delay buying anything I could until the end. If ideas didn't work out, I simply stopped and went a different route. I kept at it for a total of around 500 hours. I didn't track time very carefully. There were days where things went like gangbusters, and others where I'd sit and stare. In the end, I basically have a re-bodied Miata. I trimmed about 400 pounds of fat from stock. She's fast, but not V8 fast and handles like a dream. No one has any idea what she is, so she always gets a second look. Stock 1992 Mazda 1.6L DOHC fuel-injected four cylinder engine. 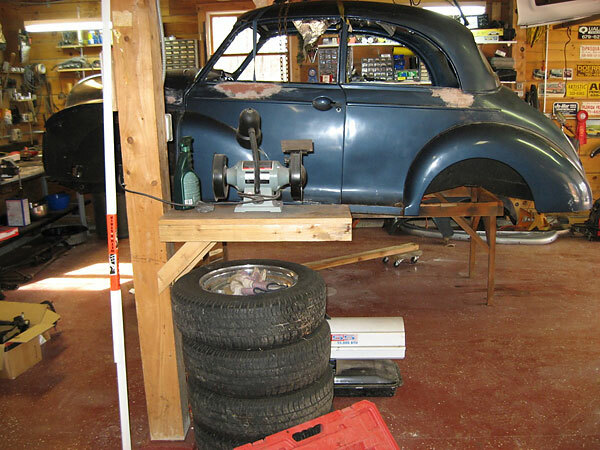 "I found a shop that was able to mate an original Minor speedometer to a Miata cable. perfect time and has that period look." MGB tachometer. Grant GT steering wheel. 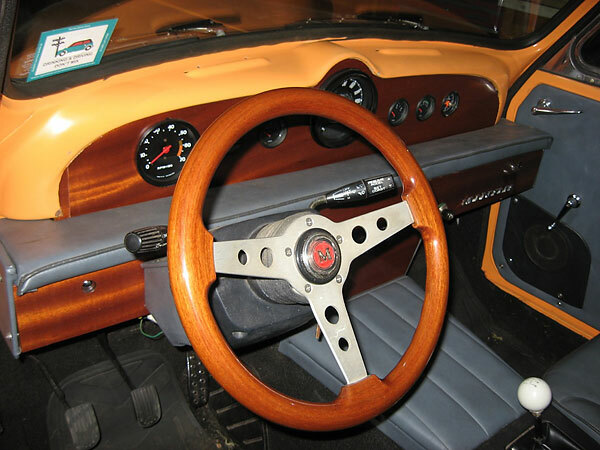 "The dashboard mahogany was shot with clear lacquer and wet-sanded between coats." "I already had the seats, I just needed to weld Miata runners to them. It was tough to squeeze them in because the Miata tunnel is wider." 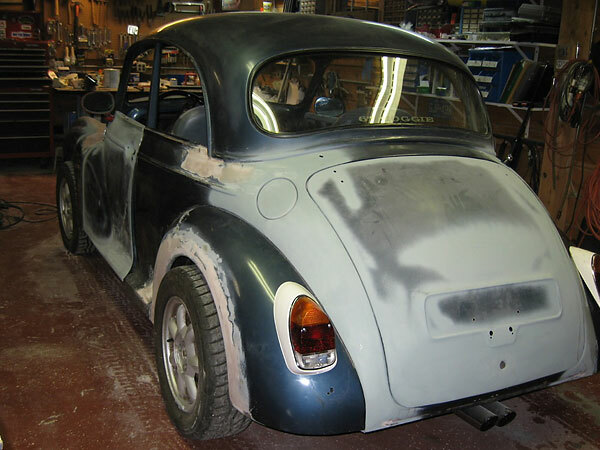 "I gutted the Morris Minor until there was nothing but body left. I removed the dashboard, but left the dash cap in place." 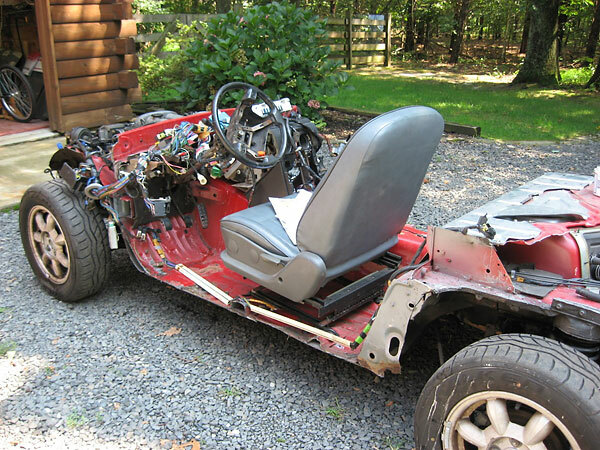 "On the Miata, I basically cut away anything that wouldn't fit under the Minor shell. those brackets gave me much-needed welding practice early in the project." 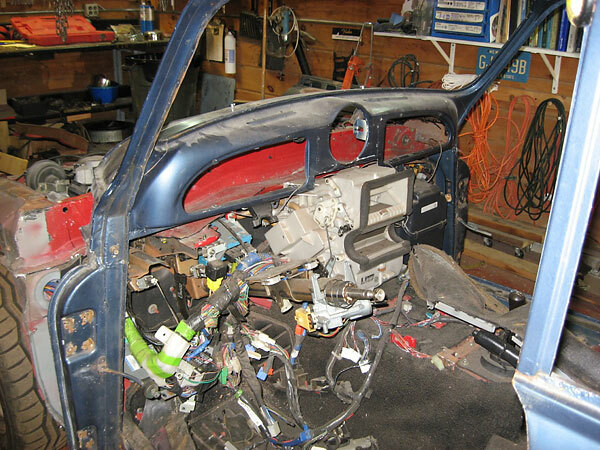 "I removed the air bags, wiring and sensors - that got rid an awful lot of wiring. The rest of the Miata wiring I left intact, as most of it would be used anyway. heat and defroster later - and that I didn't really need air conditioning." front body of the Minor." 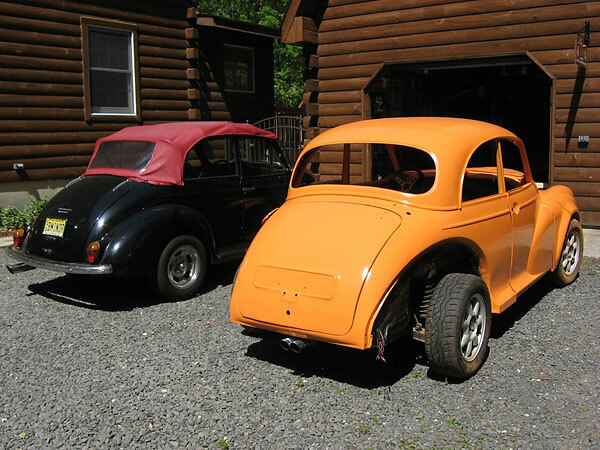 "I welded the fenders, hood, and front together to make a one piece unit. 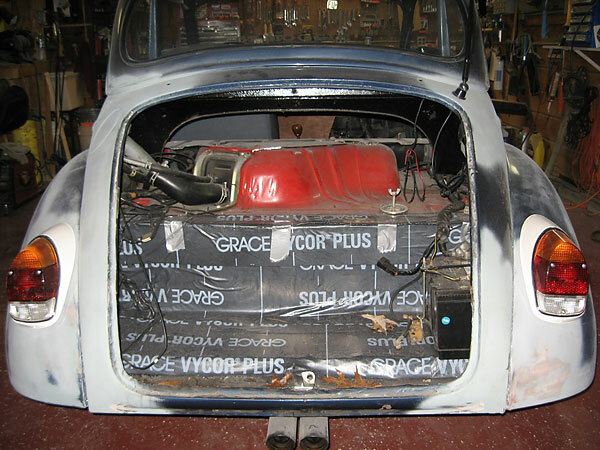 It mounts on original Morris Minor hinges." attached them to the body it would work." Mazda Miata recessed fuel filler cap. out from the body and gave a much wider stance." 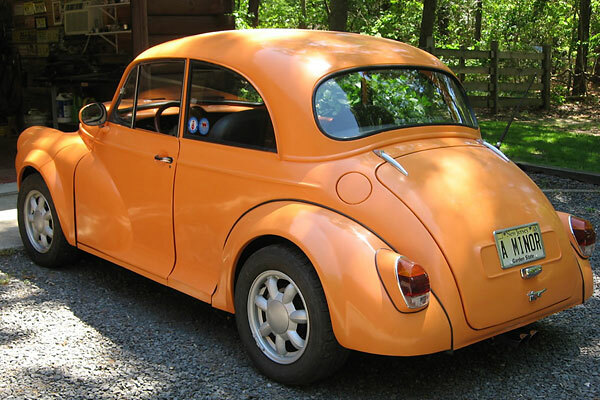 1974 Volkswagen Beetle taillights with built-in back-up lamps. Mazda Miata cooling system and front suspension. 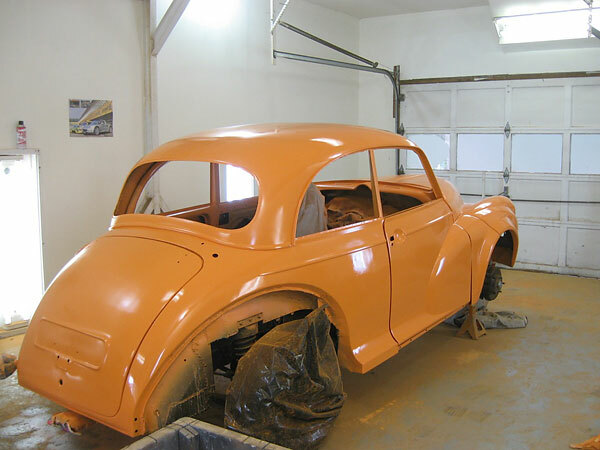 "Rayflex 'Omaha Orange' paint with some white added to make it a bit lighter. It's two stage paint, and I shot it in my back garage with an HVLP gun." Mazda Miata side view mirrors.